Look, I understand that it’s too in the day early to start talking about mothers. And, at the age of 30, when I say mother, what I really mean is “me, sooner than later” so it sounds a particularly ill-chosen term, not to mention that my mother is a wonderful cook, as is my husband’s mother as was her mother and what I really actually mean is “this is not your (fill in the blank) deli’s/lunch room’s typical, watery/soggy/oily/white/mysterious two-ounce Solo container of forgettable and soon-to-be-chucked coleslaw.” But that makes for a terrifically bad headline. Like most of us, I’ve never been a fan of coleslaw, as nearly every one I had ever tried was god-awful. I thought it was because I didn’t like cabbage, but this has turned out not to be the case. Then I thought it was because I didn’t like mayonnaise, but this, too, turned out to be a farce. (An aside: have you ever made mayo? It’s really easy! We should totally do it some time.) As it turned out, it was coleslaw, the way it is typically prepared (read: scooped from bucket of mysterious origin and packing date), that I loathed. Ding, ding, ding; we have winner! 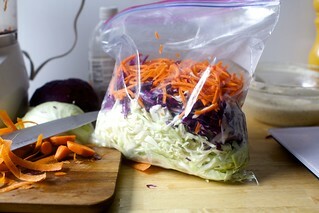 Here’s how I get this salad ready for picnics, potlucks, and other summer flings: I prepare the cabbage and carrots and keep them in a big container or gallon bag. I make the dressing and keep it in a big jar. And when needed, I assemble what we need with chopped parsley. The parsley doesn’t add a significant flavor, but it does make the salad look like a show-stopper. You could also use ribbons of kale for a modern twist. I don’t use the blue cheese as often, but if you’ve got friends and family who like it, they will love it here. The prepared vegetables without dressing will keep for 5 days in a bag. The dressing without blue cheese keeps… well, I can’t say forever, but there’s honestly not one thing in there that shouldn’t keep for a month or two. We keep it in an airtight jar in the fridge. With blue cheese, I’d use it within a week. This makes too much dressing for this quantity of salad, we have never used it all. But it keeps well (see above) and also makes an awesome dip for crudités. Refreshed in 6/17: With fresh photos, weights, and more detailed notes. 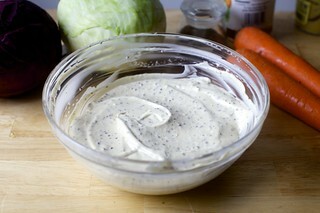 Make the dressing: Mix the mayonnaise, mustards, vinegar, celery seed, salt, and pepper in a smaller bowl. Stir in blue cheese, if using. Prepare the vegetables: Halve the cabbage halves and cut out the cores. Slice the cabbage as thinly as you can with a sharp knife, on a mandoline, or with a food processor’s slicing blade (lay the cabbage horizontally in the feed tube). Transfer chopped cabbage into a large bowl, fishing out any very large pieces and slicing them thinly by hand. Stir in the shredded carrot. If you’re going to dress this later, this is the best stopping point. To serve: Up to an hour before you’ll eat the slaw, toss the cabbage mixture with dressing to taste –- you will want to start with half and add more as needed — and parsley. Adjust seasonings as needed. Note: No matter how gargantuan the salad looks right now, it will soon wilt down a bit and yield moderate portions for 8 to 10 people. Can i brag about an e-mail i got from Ina? Ok OK it was a response from 1 i had sent to her.. BUT STILL.. I wanted to cry.. I didnt think she’d actually write back to lil ol me. She did an episode (about a year ago) on truffle making and me being a fan of all things milk chocolate, wanted to know how to make them more “milk-chocolately”. She gave me a few suggestions and said to e-mail her back the results. I decided I’ll leave truffle making up to the chocolate professionals. You want to try something warm and comfy of hers that she makes try the chicken stew with biscuits… I’ve made it a bazillion times and have found my own ways to tweak it so its not as fattening. Oh and the lentils.. soo yummm. I have recently found my love for coleslaw, as I too thought I hated it before. There’s a little pub in the next town over that serves terriffic coleslaw along side their incredibly tasty burgers. I was trying to figure out what they used so that I could try to make it at home, and to my surprise, they include shredded green pepper in their slaw. I’d never seen that before. It’s delicious and adds a hint more sweetness. Mm, cole slaw! I just was over at Pearl Oyster Bar and they have this re-interpretation served with their crab cake that was to die for. I think it was jicama. So good. Thanks for the recipe. As for NaBloPoMo, I’m doing NaNoWriMo, as well, so NaBloPoMo will probably get shafted when I’m busy at work (since I am refusing to engage in NaNoWriMo at work, I have precious time to spare…). Good luck! IÃ‚Â´m anti cabbage (except for chinese spring rolls), but IÃ‚Â´m thinking of giving this a try. About the mayo, I did try it once (a garlic version) and loved it. I made it with a hand blender, so it was a breeze. IÃ‚Â´ve just received a book called The BookloverÃ‚Â´s Cookbook, which has 200 recipes inspired or mentioned in famous books and it looks great so far, so I might get some material from there. I’m impressed you’re doing the NaBloPoMo thing! And I love this batch of pictures; they’re particularly vivid. Your pictures are always good but these really jumped out at me. 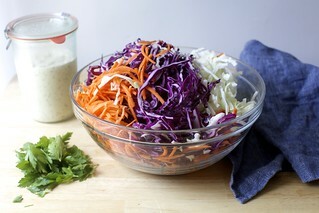 I also love coleslaw and right now when cabbage is so cheap is a good time to make it. Am I the only one who doesn’t know what NaBloPoMo is? Someone please explain! Cupcakes – I’ve made Ina’s truffles and they’re actually super-easy & yummy. as long as you don’t mind your hands being completely covered in chocolate (and, really, how bad is that?) – I gave them as extra-Christmas presents last year & everyone loved. Recipe suggestion!! i know a while back you made, pierogies (sp?). your recipe is much different than my mother’s. her heritage is russian and she also makes something called a haluski but she uses a potato base instead of the traditional cabbage. i’ve never had any other haluski, than her’s, and i thought maybe this recipe would be fun to work on. awesome that you are doing the nablopomo! can’t wait to try out the recipes. good luck! Deb, do you have any Turkey Day recipes to suggest? By the by, the Wash Post had a great article about dessert recipes from pastry chefs home cooks could undertake. I thought you might be interested. Here’s my chef pet peeve. When they say “good” something. LIke “good” olive oil or “good” mayo – I know they can’t hawk stuff on tv, but at least kind of show me so I can guess. I don’t really love mayo all that much but I adore cole slaw, so what constitutes “good” mayo? There’s a post for nablopomo (or whatever the acronym I’m too lazy to scroll up and see is). What is “good” olive oil? I use Olio Santo olive oil from California which is available at Williams-Sonoma and specialty food stores. I think it’s light and flavorful and a perfect all-purpose oil for cooking, salads, and dipping bread. I prefer Hellman’s mayonnaise which is called Best in the Western part of the US. If you live in the South and can buy Duke’s, it’s also terrific. I want to make my husband a really nice French meal for his birthday next week and the first person that popped into my head to ask was you! I’d like to make an entree, main and a beautiful dessert. Can you give me an idea for a menu and recipes? Do you have any favorites/suggestions? I hope I’m not being to presumptuous! The lentil and tomatoe stew? DEEEEELISH! Thanks for making fall a little sweeter. Love the blog (thought I would miss the old one, but I am so into this one now!). – ok, so I’m not a foodie, but you sooooo are. and another for keeping her big russian man well fed YAY! Speaking of registries – you wouldn’t happen to have the list of essential home cook/baker items that I should put on my wedding registry would ya? I’ve registered for everything I THINK I want/need but probably have forgotten something wonderfully exciting and important. Plus – the registry, she is getting low, and needs replenishing for the day is not even here yet. LOVE the food pics by the way – everything looks perfectly yummy. I’m a big fan of your recipes and your photos. Excellent site, I must thank Julia for pointing it out. Howabout some sort of stir fry? Or, I don’t know if this is a bit too midwest for you, but a kind of pasty? So: you’re my hero, Deb! Good luck this month! Don’t be afraid of the candy people, it will only love you back if you make it…and your thighs! Also, I made the mac and cheese recipe from a few posts back…EXCELLENT! I’m going to make a tomato soup tonight to eat with the leftovers. Deb, how would you like us to submit recipes to you? Also, what kind of copy right information would you need? My favorite coleslaw recipe has blue cheese in it – not a lot, but enough for that certain tang. Yum. Cupcakes – Love it. Chicken stew sounds great, too. As for milk chocolate, I was surprised to learn back when Jacques Torres had his odd little show on the Food Network that he just works with dark and white, mixing the two at different levels to achieve everything in between. Have you ever tried adding white to dark to make it more milk chocolate-like? Jessie – That sounds great, the green pepper. I like the idea of bulking it up with vegetables. I know it’s not traditional, but this coleslaw reminds me that it really is a salad + dressing, so anything should go. Yvo – Yum. I have seen more interesting cabbage salads with crab cakes, too, on menus, I guess people like the flavors and textures together. Should I mention I don’t like crab cakes? Er, nah. Marce – I should try those recipes. I have to admit being a wee bit put off by the stuff since we had a dulce du leche-filled doughnut forced on us (woe is us) at the Doughnut Plant a few weeks ago. I know it sounds good, but it turned my stomach for some reason. I will persevere! Your suggestion has been noted. Julie – Don’t be impressed yet. :) The first days are easiest. Heh. Jessica – Mrs. Kennedy of Fussy.org fame spearheaded NaBloPoMo to encourage participants to post every day for a month, that month being November. Sort of like forcing the wheels into action, getting those juices flowing, etc. For me, it’s more like Finally Proving Once and For All That I Am Batshit Insane. Meghan – I haven’t made truffles – though, I’ve always wanted to make the ones from La Maison du Chocolat (the recipe used to be on Epicurious but I can’t find it; if anyone has it please, please, can you send it to me?). It’s not supposed to be hard at all. I just don’t know how I could trust myself not to eat all of them. Even from the freezer. Heck, especially from the freezer. Amy – We do not judge people for their food preferences at Smitten Kitchen. That said, if you want to “whiten” or “watery” it up, just leave the dressing on and use most of it. You can even replace the red cabbage with white. Bawdy – Ohh. Hm. Were those the Russian ones, more bready and filled with cabbage? I actually didn’t love them. They were good, but my mother-in-law does a much better job, and uses phyllo for wrappers, saving much time. A second time, I used mushroom pierogie filling to make dumplings, which were awesome and my husband still asks for them. I’d love to see your haluski recipe. Susanne – For now, I would start by recommending the wild mushroom galette, the acorn squash with chili-lime vinaigrette and the squash soup, but I promise to add more, as well as pie and cranberry tips, as the month passes. Sarah – Oh no! That’s, uh, terrible, those, uh, other people who do not like cilantro, what terrifically bad taste those, you know, people who are NOT me have in finding it, possibly, to taste a little like dirt. Blasphemy, indeed. C – I agree, “good” is a pretty annoying term. Like it’s all going to go to hell if you don’t use $15 fleur de sel or something. I mean, I’m all for quality ingredients, but I’m even more for getting by humbly, and making the best of what’s in your pantry. In addition, cooking (as in sautÃƒÂ©ing, frying) in expensive olive oil is, I’m sorry, pretty silly and my eyes roll when I hear FoodTV people suggest it. The flavor gets more bitter over heat, and it makes more sense to use either a less flavorful olive oil, like one that is not extra virgin, or a neutral oil, and save the fancy stuff for things like drizzling at the end or salad dressings, places where it’s delicate flavor will come through. Shelly – Yes! I can. But, I haven’t cooked them here, yet, so you’ll just have to trust me. First, you should make French Onion Soup, because it’s amazing, and not particularly hard. I love Julia Child’s recipe. In fact, I love all of her recipes and might you consider buying her first cookbook? I promise you won’t regret having it. In it, her Coq au Vin and Beef Bourginon are unparalleled in their tastiness. As sides, you can lightly dress some greens with a quick oil/champagne vinegar/Dijon vinaigrette or briefly steam some haricot vert. Finally, for dessert, you should make Molly’s Tarte Tatin. Tarte Tatin is ludicrously delicious, not very hard to make, and very showy. Mary – Why thank you. But Alex prefers the term “like bear” over “big.” And yes, I am just kidding. Suzanne – Eeks. Really depends on what you, personally, like to make the most. But, a good, large old-school sautÃƒÂ© pan, and a big Dutch oven are two essentials. After that, one chefs knife. (I hate to use the term “good” – see above comment – but in some things, like knives and pots, the money you invest will be the money you get back from them when they never need replacing.) A couple standard-sized baking pans and, well, a Microplane grater and an immersion blender. I can’t live without either. Adrienne – Sounds good, re: stir-fry. Did you mean pastry? I can do that; I certainly don’t mind making them, as long as they are not more about appearance than taste, as many of the fusspot things in bakery windows appear. E – Thanks for the cheering section! Jenifer – If you want to send me a recipe, though I can’t make any promises of getting to them, just let me know where you got it, magazine, cookbook, etc. I just like to source things when I mention the recipe. [Anyone cookbook author who wishes to get up in a twist that I wrote about, cooked and publicly promoted their recipe, thereby encouraging others to buy their books, is one I don’t care to showcase, anyhow.] As for tomato soup, my new America’s Test Kitchen Cookbook has a classic tomato soup recipe that’s supposed to be like Campbell’s but way better, and I have been ITCHING to make it since I saw it last night. Maggie – Then do I have good news for you! 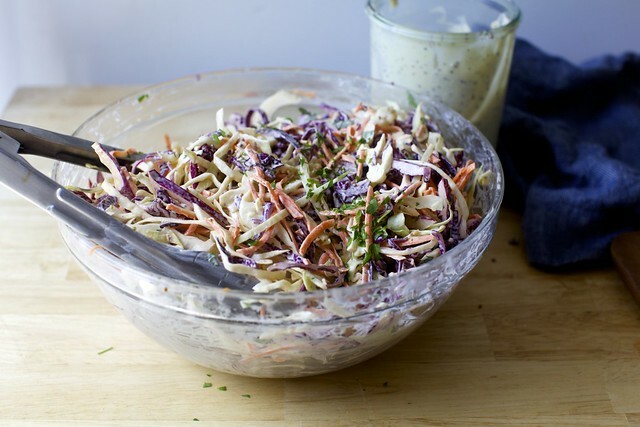 Her original recipe for this slaw calls for 6 oz. of crumbled blue cheese mixed into the dressing. I left it out because it seemed a little heavy for what I wanted. I’m sorry to have kept that from you! First, I love reading your site and impressed by your ambitious daily posting attempt! Now, can we talk Thanksgiving? Or more importantly, what to bring to the ever-present office pot luck deal? I typically bring something traditional (yawn) but would like to shake thing up this year….course, the main stipulation being that it has to keep well. Sure others have encountered this problem, any suggestions would be welcome! Thanks. How about a photo tour and description of your kitchen before and during a cooking session. Just an idea to keep ya blogging. That floral photo is easily the best ever. Your pic skills keep getting better, and I really am enjoying the transition from Smitten to Smitten Kitchen. Thanks! I am one of those who despise the standard mayo-based coleslaw. I favor crunchy variations that I make in an Asian style, with red cabbage, napa cabbage and some regular green stuff, green onions, julienne carrots and sometimes red pepper. I have tried several asian dressings that have been acceptable, and toasted almonds and ramen noodles for a crunchy additional topping. Dressed just prior to eating and it is wonderful. Then for dessert (TO DIE FOR) this chocolate stuff that was suppose to be mousse that was made with chocolate, coffee, cointreau and eggs. It was so good we didn’t care that it was a tiny bit runny! And its so rich I’m still in the process of eating mine! Yes, cabbage keeps forever. Frightening. My favorite coleslaw has a good amount of crumbled blue cheese added. It adds tang and funkiness, mmm. My mom’s coleslaw recipe is absolutely the best, I think. 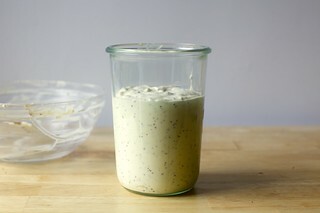 It’s hella easy too: Mix mayo, regular sugar and milk together until mildly runny. Mix in shredded carrots, cabbage and peppers. Let it sit for half an hour in the fridge. Consume. Mmmmmm… simple and yummy. Another delicious spin on cole slaw is to skip the mayo-dressing and spring for an Asian-inspired vinagrette. I usually mix vegetable oil, rice wine vinegar (or even white/cider would be OK), a splash of soy sauce, a couple tsps. of toasted sesame oil, 1 Tbsp. 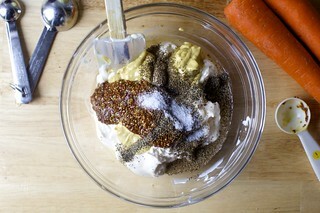 of toasted sesame seeds, and some ginger (grated fresh or dried). Excellent on shredded red cabbage, carrots, and a bit of minced onion. My bf adores it. This looks very tasty! 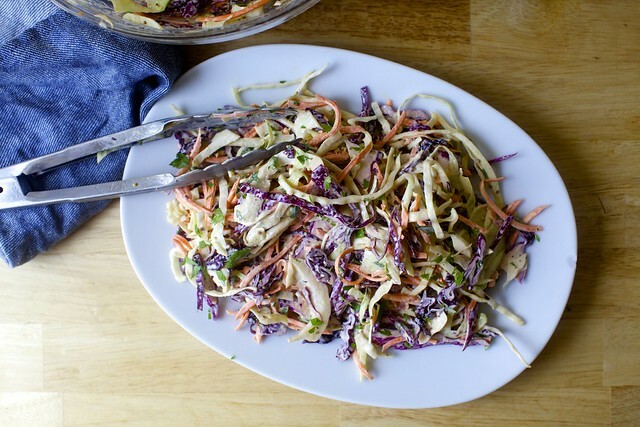 Have you tried the buttermilk coleslaw from Cooks Illustrated? 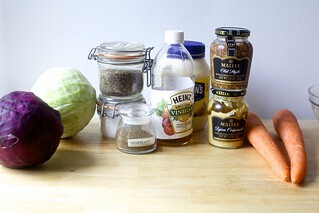 The cabbage is salted and the water squeezed out before the dressing is applied. I could eat way too much of it. You didn’t mention that I would have enough coleslaw to feed a village from one head of cabbage. Thanks for the recipe! It made me some yummy slaw! You’re not kidding! In fact, I made this again a couple weeks ago and thought, gosh, I really need to update that recipe to say that there is way too much dressing and an absurd amount of cabbage. Oh, and then I had a bunch of beers and promptly forgot. Thanks for the reminder–glad you liked. I made coleslaw today and I used some of the extra dressing to make devilled eggs instead of plain mayo, delish! Coleslaw never looked so good! Beautiful. I linked to this recipe today. Happy Spring! I took this slaw to a cookout. It wasn’t a huge hit. I put the blue cheese in it, which I liked, but I’m not sure that everyone else did. I wish that I’d followed Deb’s instructions and not added all of the dressing. It would’ve been fine with about 3/4 of the total amount. It is a very pretty slaw with all of the colors. This is the fourth or fifth recipe I have made from your website. You are AMAZING! I served the coleslaw with a grilled pork tenderloin and wild rice. The slaw was wonderful, pork tenderloin, so/so. So, I’d love to see a new pork tenderloin recipe if you can manage! My boys LOVED the apple cake the other night to round out a pasta dinner. Well, if my slaw turns out half as nice as those photos I will kiss you!!! This was fantastic. I didn’t even have a number of the ingredients and substituted yogurt for 1/2 the mayo, and I can’t wait to serve it tonight at our cookout. It already has 2 thumbs up from my mom and I! yum! a quick and easy lunch side. we went heavy on the blue cheese, love it! Thanks! We left out the blue cheese b/c of a guest’s allergie, and it was still fantastic. I made it with an amazing pulled pork slow cooker recipe, green salad, and the chocolate pudding pie you posted here. Actually, two chocolate pudding pies and it was all gone in a nano-second. I think the chocolate pudding pie was nostalgic for the adults and plain yummy for the kids. Both are definitely in my summer rotation. As usual, thanks for the great recipes. I made this today (plus about 4 tablespoons sugar to sweeten it up some) and it was fantastic! I love the mustard tang to it. Thanks for a great recipe coming from someone who will ONLY eat homemade coleslaw since I have never had one I liked anywhere else. Thanks for another great recipe! Delicious! The combination of vegetables is perfect, and so pretty. Even without the optional blue cheese, I found I needed only half the dressing. Made this cole slaw for our Memorial Day BBQ and it was delish! Thank you for another great recipe. Loved the blue cheese in the dressing! mmmm delish, and thank god, I made enough for an army, we’ll be eating on this for days! i tried a slaw at a bbq joint that had a distinctly southwestern flavor…i know it had cilantro in it which is an easy thing to add, but do you think chipotle powder or even some fresh jalapenos could be added to a dressing/into the cabbage mix? Can you think of anything else to add? Cumin? Hi Rose — Maybe start with this very simple slaw and add chipotle powder and maybe even lime juice to the dressing, toss in cilantro. You can increase the green pepper, too. A pinch of cumin would also be tasty. Deb, I can’t TELL you how delighted I am to see that you originally were not a slaw fan!!! Having been watching your site for some time now (but not in fact since 2006) I know that in the summer slaw makes it into your rotation with frequency. And I always want to make the slaw because everything of yours I have made has been absolutely blissful, and I know that you, like me, are in love with many foods – but only when they are made the -right- way. So I see this post and think “oh! she didn’t always like slaw either! maybe I can be converted too! !” I am going to make one of your slaws this evening, to go with some jalepeno-orange chicken and grilled corn. I’ll let you know if I’m converted. This is the slaw I have been looking for all summer! I have tried several of your others (cabbage and lime salad, napa cabbage with buttermilk dressing), wanting very much to like them. Yours are recipes that I give a first run for company, but I have finally realized my problem: I really despise mayo and I was looking for something that tasted amazing and was interesting. THIS is that recipe. The veggies/fruit took a lot of cutting, but it was worth it for the pleasantly unusual flavors—-love the mango, pepper, cashew, lime blend. It does make a large salad, but even so, I was disappointed to find my husband and 14 yo finished it . Now I’ll pluck up and try your other slaws that don’t have mayo. Thanks for your wonderful recipes! Well, Deb, I promised I would let you know if I was converted, and by God, I think I am. I used this recipe as my base, and made the dressing exactly. I subbed red onions for the carrots (based on what I had on hand) and used only Napa cabbage (again, that on-hand thing) and did everything else the same. Oh my. It was crisp, tangy, creamy, and dare I say – refreshing! I actually looked forward to eating it again and again until it was gone. I kept the dressing separate from the veggies until time to eat and the whole thing kept for a week, absolutely as perfect as the day I mixed it all up. You have changed me, Deb. In a good way. I didn’t use all the dressing and I love the tang the mustard adds…. What is whole grain mustard? Is it sold in a jar like the dijon, or does it come in a different form? I tried this recipe without it and it was so awesome! I didn’t think I would like coleslaw that much! Melanie — Generally, a coarse mustard. I made this for the superbowl. It was to die for! I just made this today and it has to be the best cole slaw I’ve ever had! oh… I did make my own mayo for the first time. It was a good day. Thanks! This was so good I had to hold myself back from licking the bowl. Made a half-recipe and still plenty for a couple lunches! Thanks for all the wonderful recipes, Deb – I’ve loved the ones I’ve made! Yummy! Made this with tacos and was sooooo delicious. Perfect foil for spicy pork tacos! I stumbled on this recipe today, and made it as a side for tonight’s dinner (cutting way back to about a quarter of the recipe). Just to say, it was GREAT!! So glad there are leftovers for tomorrow’s lunch! I love it and overeat it. I like to add maple walnuts. I have made Ina Garten’s “Not your Mama’s Coleslaw” recipe many times and it is indeed delicious. The only reservation I have is that she suggests adding the dressing to the cabbage only one hour before serving. My experience has taught me that the dressing and cabbage should be combined at least a day in advance. This allows the flavors to marry and the dressing to have a creamier consistency. I can assure you that the slaw remains crispy and fresh tasting even though it has “marinated” for a day in the dressing. How good is this stuff?! Thanks for your recipe. Quick question… how many servings in the cole slaw recipe? Angela, I was wondering the same thing! I made it according to the recipe, upping the green cabbage to 3/4 instead of 1/2 because I was nervous about there being enough. I brought it to a cookout of 8 people and there was just a small bit leftover. So, I’d say serves 8 :) And, as long as I’m writing, I should say that it was delicious and a huge hit with the group! Should have read the reviews before I mixed the dressing with the veggies. Mine was way more soupy than the photos! So I ended up adding all the rest of the cabbages and 2 more carrots! Still too much dressing. Oh well, it is, after all, “Good” mayonnaise! Lol! Oh, and there’s a new brand of eggless mayo called “Just Mayo” and it comes in several flavors plus plain. I’ve found it at Costco and Safeway. Terri — Oops, sorry for the trouble. I’m overdue to mention the imbalance of dressing; will update now. I’ve made this twice, the second time WITHOUT the mustard, much, much more pleasurable. I’ve made this a few times and liked it pretty well. I made a batch for a holiday party recently and for the first time used the optional bleu cheese since I happened to have some on hand. It doesn’t seem like that much bleu cheese given how much dressing it makes, but people just went crazy for it. Do try adding it if you haven’t- it sends this recipe into the stratosphere. Made this salad for 4th of July cole slaw with napa cabbage. Everybody liked it! This dish was bland – just no flavour. Needed something to boost the flavour. Disappointing.Needs some tweaking I think. Random question – this dressing is truly the greatest ever produced anywhere on the planet, and I’ve made it a million times. What would you think about using it on a potato salad instead of coleslaw? Is it too runny? This is the Best Coleslaw Ever. I just made it again for the zillionth time. Dressing is even better after it’s been in the fridge awhile. I make a full sized batch and it keeps me going fo a week or two. I haven’t poisoned myself yet. Congrats on the new website design. It works really well on my phone. I forgot to mention that without the addition of apple cider vinegar this works nicely on a toasted tomato sandwich. The vinegar makes it too runny for a sandwich. I found some vinegar powder at Penzey’s. That might be a good substitute to get the sharp flavor and keep it from being too runny. I knew this would be a winner the moment I saw celery seed listed as an ingredient. Yum! Thank you. After sending this yet another person, I just wanted to say thank you. This is so hackable in that I leave out the green cabbage, parsley, whole grain mustard, celery seed and the blue cheese (so it’s not really even your recipe haha) and it’s still delicious and I have so many people ask for the recipe! Hi Deb! I’m about to make this for a summer jam bbq and so excited! but wanted to ask you – how many people does this recipe serve? Having recently discovered this recipe, I am making this every week, it seems. It’s that good! Have variously added chopped broccoli, red peppers, red onion . . . Used combo of napa and red cabbage . . . always with a killer blue cheese from Twin Sisters Creamery in Ferndale WA. Excuse me, I must have seconds right now. For the green garnish, instead of parsley I suggest thinly sliced green onions. They add colour AND flavour! Cilantro is another. do you think feta could work instead of blue cheese? Delicious! Try subbing lime juice for the apple cider vinegar and cilantro for the parsley. And if you’re feeling adventurous and your family likes zip in their food as mine does, some chili powder. Took it to a cook-out as above last weekend to rave reviews and second helpings! I made this with julienned carrot, broccoli stem, and kohlrabi, no cabbage and blue cheese. Everyone loves this slaw and this slaw dressing is my go-to for EVERYTHING! Thanks Deb!